When you think you’ve dropped a stitch, the first thing to do is find and secure the dropped stitch. When you drop a stitch, it’ll cause your knitting to unravel, so find and secure it immediately. To find a dropped stitch, carefully spread out your stitches along the needle and slowly scan the row(s) below. The telltale sign of a dropped stitch is a horizontal strand of yarn that isn’t pulled through a loop. You can identify a dropped stitch a couple ways. If the dropped stitch hasn’t unraveled far or if you just recently dropped it, you should see a horizontal yarn that didn’t get pulled through. If the dropped stitch has worked itself down several rows, or if you didn’t notice its absence immediately, it should appear as a wayward stitch at the bottom of a ladder of unworked strands. 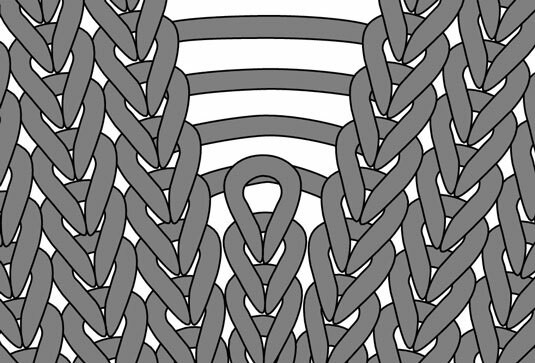 Each strand represents a row. When you find the dropped stitch, you need to secure it so that it doesn’t unravel any more. To do so, carefully work a small needle tip, the blunt point of a tapestry needle, a toothpick, a nail, a bobby pin, or anything into it to secure it and stretch it out a bit. Then, use a safety pin to secure the stitch.